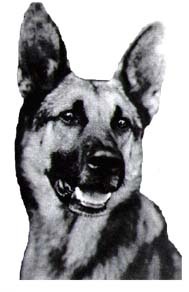 Strongheart was the first German Shepherd dog to appear in motion picture movies. He paved the way for the better remembered Rin Tin Tin. Born in Germany on October 1, 1917, this former police dog began his acting career in 1921. Originally named Etzel von Oeringen, he was trained in the style of K9 Police Dogs and assigned to the German military during WWI. A descendant of a very carefully bred line, the 125 pound dog was fearless and powerfully built. Famous animal trainer and American director, Laurence Trimble and his screenwriter wife, Jane Murfin, began searching for a dog in Europe that could appear in motion movie pictures. When Trimble came across 3 year old Etzel von Oeringen in 1920, he knew he found what he was looking for. Trimble had to work very hard to socialize him and de-empahasize the harsh training he had received as an aggressive police dog. For months on end, Trimble kept the dog by his side virtually non-stop, using continuous positive reinforcement for good behavior. Eventually, he shed his police aggressiveness and became a very well trained animal. But, as a great judge of moral character, he never lost his instincts. He would often pursue passersby that were later found to have been frauds, embezzlers or were abusive to their spouses. And he was a great actor. His human counterparts on screen were pleased with Strongheart, for even though he tore their clothes to shreds, he never left a mark of fang or nail on any actor. After his first movie, he gained a large following. He traveled across the country by train and many came out to marvel at this beautifully trained dog. A nationwide star was born. Lady Jule, a beautiful German Shepherd, was introduced to him and they produced several litters. Sadly, he was injured at the height of his career. While filming a movie, he slipped and fell against a hot movie light. The burn, which initially appeared minor, progressed into a tumor within a few short weeks. He died soon afterwards on June 24, 1929. Another grandson, Silver King, appeared in movies as well. A very intelligent dog, Silver King is better remembered for his personal appearances and training children in safety programs. The line continues to this day. As a tribute, you can still find Strongheart Dog Food (though, unfortunately, it is not a great quality dog food). You can find his star on the Hollywood Walk of Fame, located at 1724 Vine Street.